Note: While Cathy is on Sabbatical, Louise is writing all the reviews. Cathy will return March, 2018. Bornstein explains, “For a very long time, I did not talk about what happened to me during the war. But then, one day, he was searching online and came upon a website that claimed the Holocaust was a lie. His photo, the one that is on the cover of this book, was being used to manipulate history by claiming that the Jews had lied when they said their young were killed on arrival in Auschwitz. The book is written in collaboration with his daughter, Debbie Bornstein Holinstat, a producer for NBC and MSNBC. Survivors Club tells the important story of what happened to Michael and his family before, during, and after the German invasion of Poland after 1939. The Bornstein’s used interviews with relatives, survivors who knew the family, primary sources, and Michael’s own recollections to recount one family’s inspirational story of survival. To hear more about the book, watch this movie. 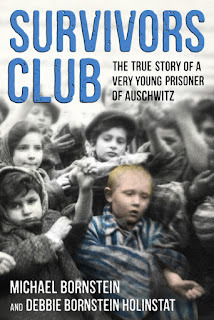 Click here to learn more about Michael Bernstein and his book, Survivors Club. An important addition to books on the Holocaust. Give this to students who ask for Diary of Anne Frank, Hanna’s Suitcase, and Maus I & II. In this growing climate of hate, Survivors Club is a story we must never forget. To write this review, I used an ARC and a final copy, both books supplied by the publisher. Oh, my gosh! This story is very moving. My heart is heaving with emotion. Courageous survivors filled with hope believing "This too shall pass". Michael Bornstein's story must be told. Thank you for introducing me to the SURVIVORS CLUB and Michael Bornstein's story. I look forward to reading this book. Hi Suzy -- Yes, I was also deeply moved by this book. I am so glad Michael Bornstein told his story.